Spiders just shouldn't get so large that they can straddle something made for human hands. Seriously, this spider has a potential leg span of 12 inches. 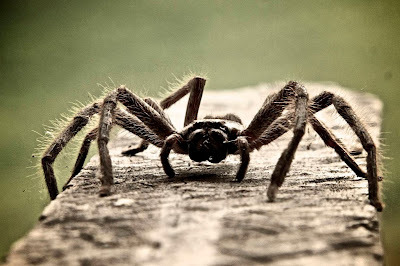 They're known as huntsman spiders, giant crab spiders, wood spiders, or rain spiders. I know them as brown-out-in-my-pants spider. Thankfully, they've already been assigned its scientific name (Sparassidae), because the name I use doesn't translate well into Latin. oh what a beauty! hello cutie! Is a huntsman spider the same as a wolf spider? We used to find one of those trapped in our bathtub about once a month and had to lure them out with a piece of paper for release to the wild. Awww, all the better to hug you with!